Sandy Bakic (center) said that after 30 years operating the Campau Tower, it’s time to close for good. 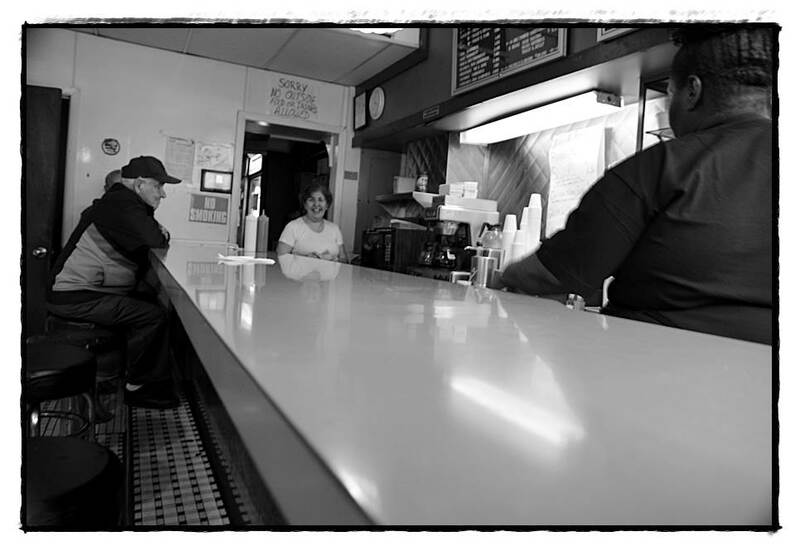 The landmark hamburger joint served up its last meal on Sunday at 10 p.m.
Nick Konke has the distinction of being the last person in Hamtramck to order up at Campau Towers. The landmark burger joint at Jos. Campau and Caniff closed for good Sunday night at 10. Konke had been hosting a yard sale that day and heard from people stopping by that there was a sign in the window of the business saying that Sunday was the last day it was open for business. He heard about it a little late, and just a few second after owner Sandy Bakic shut off the grill Konke came in, asking – begging – for one more for the road. “I wanted to get the last ones,” he said. Order up: three burgers and mushrooms to go. Bakic’s family has owned Campau Tower for 30 years. Although she’s only 55, Bakic’s family also owns the business next-door, New Martha Washington Bakery. Often, she would work a full day at the bakery and then another shift at the Tower. There are also other reasons for closing, but Bakic asked to keep that off the record. Let’s just say that good help is hard to find. Considering the Tower has been open 24 hours a day, seven days a week, that’s a lot of extra responsibility. The place has history. It was originally owned by the White Tower franchise and opened here in 1925. White Tower was a copycat of White Castle. Hamtramckans have made this a hangout for decades. The cast of characters you could see here could fill an R. Crumb comic book. Konke calls the Tower an “icon” – which it is indeed. As for the future of the business, Bakic said she’s open to hear offers, but has not come up with a firm price to purchase it or lease it. “I’m always ready to listen,” she said about offers to take over the Tower. What comes with it is the secret recipe for the burgers, and how to make what some in town say is the best coffee. There are many possibilities here. This little-seater could easily be reinvented into a hipster diner. Or anything. Several years ago a local once imagined opening a sushi bar here in town. Or real special burgers (Rock City Eatery, are you reading this?). As for Bakic’s other business, the bakery, she says she has no immediate plans to close or sell. Where is “Too Tall Tony” gonna hang out now?